By the time we tied into the mooring buoy above Aquarius, we were feeling green. Six-foot seas had pushed the limits of our motion-sickness meds and we were ready to get underwater. We quickly suited up and waited for the go sign. When it came, we slid into the foamy Atlantic, dumped air and descended. Almost immediately, we caught sight of Aquarius 60 feet below, a ghostly structure on the seafloor, its lights looking equally eerie and cozy. We kicked down to the habitat and peered in a window. There, at a table, sat Fabien Cousteau in a T-shirt, checking his email like a commuter on an Uptown train. He caught sight of us, smiled and waved for us to come inside. In 1963, Fabien’s grandfather, Jacques-Yves Cousteau undertook the most ambitious underwater adventure ever conceived. He and his band of merry French frogmen lived for a month in an underwater habitat, called Conshelf II, 60 feet under the Red Sea. Cousteau made an Oscar-winning film about the project, World Without Sun. Conshelf was groundbreaking; living underwater for that long allowed the aquanauts to perform marine studies never before possible as well as the psychological and physiological effects of extended time in a pressurized environment. They brought along creature comforts: red wine (bien sûr! ), cigarettes, even a pet parrot. Five decades later, another Cousteau is repeating history. 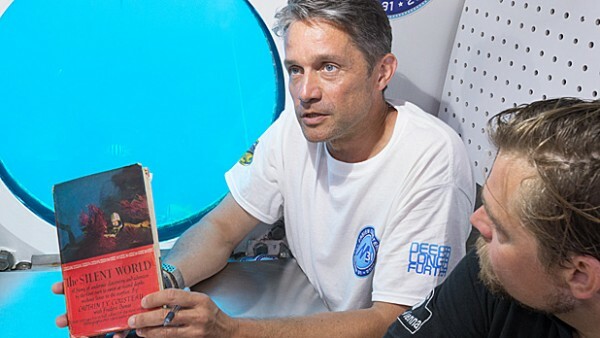 Fabien Cousteau splashed down on June 1st to embark on his own undersea mission. As part of what is known as Mission 31, Cousteau plans to better his grandfather by one day, living underwater until July 2nd. Rather than construct his own habitat like Cousteau the Elder did, Mission 31 is making use of the world’s only existing underwater research laboratory, Aquarius, which is located 65 feet under the Atlantic off the coast of the Florida Keys. Aquarius has been around since the 1980s and is now operated by Florida International University. The school bus-sized habitat is supplied with air, electricity, fresh water, even Internet, by its own Life Support Buoy tethered on the surface above. Entering Aquarius defies logic. You swim up from underneath into a “moon pool” where you break the surface and emerge inside the habitat. We were greeted by Cousteau and his fellow aquanauts, who helped us out of our scuba gear and into the cozy living quarters. We had just about an hour to visit, any longer and we would have had to go through decompression before returning to the surface. Cousteau and his crew, in their nitrogen-saturated states, couldn’t ascend if they wanted to, a deadly case of the bends awaiting anyone who dared. They were in it for the long haul. Fabien Cousteau possesses his family’s love of the ocean but also its flair for the dramatic. In this age of privately-funded adventures and science, Mission 31 had to be attractive to sponsors and also to a public with a short attention span. To appease these audiences, Mission 31 is bristling with new technologies, a 24-hour live Webcam and daily Skype interviews and classroom “visits”. Cousteau’s fellow aquanauts, graduate students from FIU, MIT, and Northeastern, will be diving eight to ten hours a day from the habitat to study everything from coral growth and ocean acidification to predator-prey behavior using new technologies such as high speed infrared cameras and wearable sonar devices. Two filmmakers are also taking turns living in Aquarius to collect footage for a documentary movie Cousteau has planned. Maybe he’ll call it, “World Without Sun, Part Deux” but we’re betting there won’t be cigarettes and red wine. No word on the parrot.